Gaius Octavius was the adopted heir to the Roman throne, being the grandnephew of Julius Caesar. His road to the throne was not so easy, however, as the nation was in the midst of civil wars especially after Caesar’s assassination. Octavius came out victorious, returning to Rome as sole master at the age of 34. Consummate politician that he turned out to be, he settled relations with the Senate of Rome (something his predecessor had totally ruined with dictatorship), rejected any monarchical title like ‘king’, preferring to be called ‘First Citizen of the State’, spread the reaches of Roman rule through conquest of much of the known world, and he turned what was a Republic into an Empire. His reign was an era of relative peace, laying the foundation for the next 1500-or-so years of the Roman Empire. He had left many architectural achievements, initiated a taxing system, an official police, and even a fire-fighting system (yes, this was all BC!) among other things, including a steady constitutional framework. He was a lover of the arts as well, relating with poets and writing some literary works himself. The people loved him. To this day, many historians consider him Rome’s greatest Emperor, considering his many achievements. Some explain, though, that his peace actually came through disguised force and ruthless methods. The Roman Senate gave him the title ‘Augustus’, meaning ‘the illustrious one’. It was a religious title designating authority over humanity and nature, and was the beginnings of a culture of emperor worship. Full of it, he went ahead to tack on, among many other titles, the title of ‘Son of the deified one’, or ‘son of god’ (the god here being Julius Caesar, who they had already elevated to god-status). Still, he hung the civic crown above his door, a crown that was usually placed over a general’s head as the Latin phrase ‘Memento mori’ was chanted, meaning ‘Remember that you are mortal.’ For all his claims to godly fame, he knew he was a man and would die someday. By 6 BC, as his age told more on him, he was already preparing his stepson, General Tiberius, to take the throne. 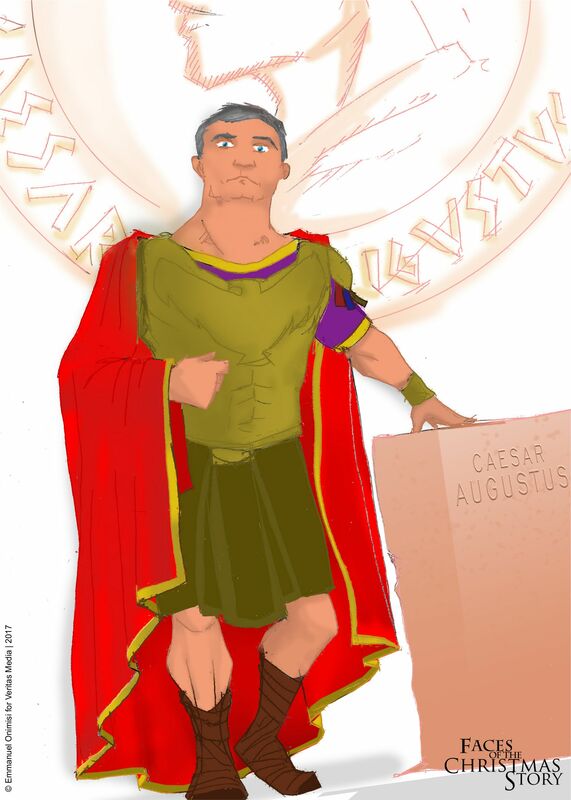 With his family name of ‘Caesar’, which he turned into a title for future emperors, Gaius Octavius is now more popularly known as Caesar Augustus. One of the lands conquered by Caesar Augustus was a middling nation named Judea, which he then annexed to the province of Syria. Moving on to more lands, he had no idea that he had just plugged in to a livewire that predated him and sovereignly superseded any authority he thought he had. He had just been joined to the history of God’s chosen people, and the unfolding of God’s mighty plan. As it turned out, Caesar sent out a decree for all in the Empire to be registered, like a census scenario, except that they would all have to return to their hometowns. This is what caused a Jewish carpenter and his pregnant wife to make the long journey from Nazareth to the carpenter’s hometown in the South. Bethlehem. It was in that town that their baby was born, a baby who was the true Son of the true God. Jesus the Messiah. Caesar played a part in the Christmas Story and exited as soon as it was done. Really, his name only occurs in one verse. But God used this pagan ruler in the ordering of set pieces for the fulfilment of prophecy surrounding the birth of Jesus. Micah had prophesied that Messiah would be born in Bethlehem (Micah 5:2), but the key players were based in Nazareth. God used the Roman emperor to fulfil His plans for His own. God used Cyrus, king of the Persian Empire, to allow the exiled Israelites to return to their land and rebuild their temple. He caused Ahasuerus, another Persian king, to favour His servant Mordechai and deliver him from death. He revealed cryptic dreams to Pharaoh in Egypt and Nebuchadnezzar in Babylon, dreams that only His servants Joseph and Daniel respectively, could decrypt in order to elevate them and set them in positions where they could save many and rule with justice. He is still doing that today. Many nations today are ruled by people who don’t know God. But that is not a barrier to the Lord, as He can cause them to order legislation to favour His own. Beyond governance, even in school or the workplace, the Lord can influence the management to make decisions that favour you. And, in some cases, when His people are thus rightly favoured and rightly placed, He can do even greater things in those offices. This is what Jesus’ coming promises us. God still rules in the affairs of men. Even of those who have rule over you. The fact that they have become your governor or president or chairman has made them subject to God’s will for you. That is something to be thankful for, and something we can trust Him for too. Caesar Augustus’ famous last words as he died were, “Have I played the part well? Then applaud as I exit.” He considered the regal authority that he’d put on as emperor, as all play-acting. He knew he wasn’t the big deal they all made him out to be. Memento mori. He died in AD 14, in his 77th year. You know, your leaders are human too. Even the worst despot has fears and doubts, dreams and aspirations, and loved ones too. They need the Lord just as much as anyone else does. The Bible encourages us to pray for all men, for our kings and leaders and all who are in positions of authority. It is pleasing in God’s sight (1 Timothy 2:1-3). Pray for them to have the right counsel, for their families, and for their souls so that they will know the Lord. As a part of God’s Kingdom, this is your duty. If all is well with your leader, the country will function well as well. As God’s children this is our charge, the watchtowers we are called to defend. Remember, we are of a kingdom that transcends these, but it’s a kingdom that serves. Pray for your leaders too. Christmas is a great opportunity for all the world to slow down and relax and rest. With fewer distractions, it is a chance for some to hear and see the true purpose of Christ’s coming: God’s plan for them through salvation in Christ. Pray for your leaders, that they encounter these opportunities and for their hearts to be receptive to listen. Jesus came for them too.